Introducing our new FlapTop MacBook Air & Pro sleeves. MacBook sleeves don’t get better than this! Your MacBook goes with you everywhere. In and out of cabs or on and off your bike, from the café to the library, while it dodges coffee drips and food spills along the way. Wherever your day takes you, your MacBook goes too, so you need a MacBook sleeve that fits seamlessly and protects like a boss. Introducing Speck’s new FlapTop MacBook sleeve. Whether you’re looking for a MacBook Pro sleeve or a MacBook Air sleeve, the new Speck FlapTop Sleeve has you covered. Not only is FlapTop designed to guard your MacBook from everyday hazards, it offers some never before seen features. Take the unique IMPACTIUM™ Foam Collision Barrier for example; a lightweight and strong, shock absorbent foam perimeter, which compresses on impact to absorb shock and protect your MacBook. No need to worry about those inevitable bumps and abrasions with FlapTop Sleeve. Then there’s the closure. Seriously, no other MacBook Pro sleeve or MacBook Air sleeve has such an intuitive closure. Speck has a patent pending on this one, it’s that special! The closure’s one-of-a-kind design features a responsive flex zone that allows you to quickly access and securely store your MacBook, while protecting it from knocks and abrasions. On top of that, you need to take a look at the profile of FlapTop Sleeve. Any extra bulk is really going to weigh you down as you get on with your day. That’s why FlapTop Sleeve has been armed with a sleek, form-fit design that offers padded protection but easily fits your device like a second skin. Throw in a water-resistant finish that’s easy to wipe clean and you’ve got all the protection you need for your MacBook. MacBook Sleeves don’t get better than this. Check out the new FlapTop Sleeve for MacBook and never look back! 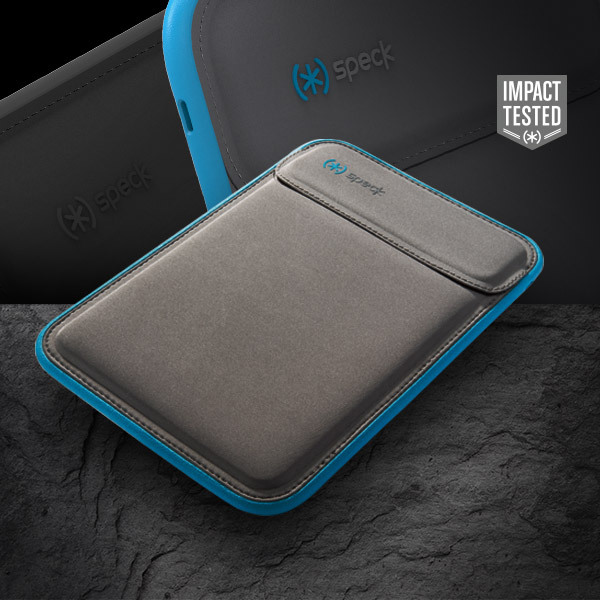 A closer look at what makes FlapTop sleeve, Speck’s innovative laptop case, so special!